Vivo caused a sensation with the presentation of his Nex smartphone. Here, the manufacturer relied on a retractable camera as a solution to the Notch problem. Now the manufacturer has introduced its successor, the Nex Dual Display Edition, which comes without a selfie camera. The Chinese manufacturer Vivo has now introduced the Nex Dual Display Edition in its home country. Instead of another special mechanism for the retractable front camera, the smartphone can do without it. The device has a second AMOLED display on the back, which measures 5.49 inches and has a resolution of 1,920 x 1,080 pixels. For selfies and videos, the triple camera on the back can be used instead, while you can see the possible result in the viewfinder on the second display. The camera itself consists of a 12-megapixel sensor (OIS + AF), a 2-megapixel sensor for depth information (called the Vivo night vision camera) and a TOF-3D camera. According to Vivo, the latter is used for distance measurement in photos, but is also used for facial recognition if you want to unlock the second display on the back. The combination of 12- and 2-MP sensor sits in a round frame that protrudes into the second display. This "Lunar Ring" serves as a notification LED, as a "flash" for photos in bad light and can also light up in the beat of the music being played. The display on the back should also be useful for other scenarios other than selfies. During the presentation of the Nex Dual Display Edition, Vivo showed recordings in which the second display is used as a touchpad on the back. It can also be used as a "mirror" for people who are photographed with the main camera. 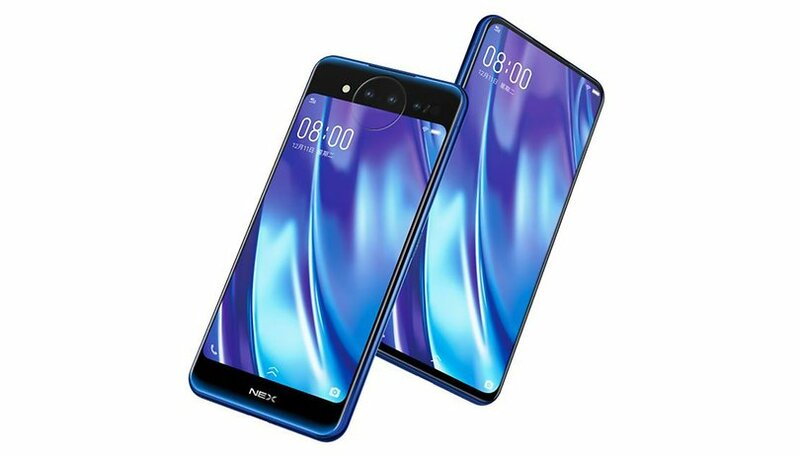 The 6.39-inch display on the front of the Nex Dual Display Edition has a resolution of 2,340 x 1,080 pixels and, like its predecessor, occupies almost the entire front of the smartphone. The Snapdragon 845 works with 10 GB of RAM and 128 GB of internal memory. The battery almost 3,500 mAh - and yes, it has a jack connector. Vivos FunTouch OS 4.5 based on Android 9 Pie is used as the operating system. This is intended to provide numerous AI functions and gestures that facilitate switching between the two screens and enable special camera features. How much will the Vivo Nex Dual Display cost? The Vivo Nex Dual Display Edition will be launched on the Chinese market on 29 December 2018 and is expected to cost 5,000 yuan, the equivalent of around 725 dollars. It supports the frequency bands 3, 7 and 20, which are important in Europe, but whether and when the smartphone will be sold outside China at all is not known so far. Vivo is not the first manufacturer to try out a smartphone with two displays. The Yotaphone, which has an E-Ink display on the back, should be mentioned as a pioneer here. But the Nubia X also has two displays and the latest hardware inside, but is not widely available. What do you think of the Vivo Nex Dual Display Edition? What kind of application scenarios can you imagine for the second display?